Collapsible lifeboat D photographed by passenger on Carpathia on the morning of 15 April 1912. 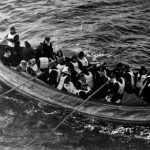 When the blockbuster movie, “Titanic” was released in 1997, telling the story of the over 1,000 people who died in the world’s biggest shipping disaster in 1912, there was no portrayal of any African or black person aboard the ship. But later research by the Chicago Museum of Science and Industry would reveal that there were a distinguished Haitian man and his white wife on board the ship. Joseph Phillippe Lemercier Laroche, who would later become the only man of African descent to die in the Titanic ship disaster, was from a privileged class in Haiti and had received education from private tutors.Born on May 26, 1889, in Cap Haitien, Haiti, Laroche was the son of a white French army captain and a Haitian woman who was a descendant of Jean-Jacques Dessalines, the first ruler of independent Haiti. A silver pocket watch with Hebrew numerals recovered from a Russian-Jewish victim of the Titanic disaster is expected to fetch more than $20,000 (£15,728) when it goes under the hammer this month. Sinai Kantor, 34, from Vitebsk, Russia, was hoping to start a new life in America when his life was tragically cut short after the RMS Titanic collided with an iceberg in the North Atlantic, on April 12, 1912. The Swiss-made, open-face silver-on-brass watch, with its original movement and a diameter of three inches, includes numerals that are Hebrew letters. An embossed design on the back shows Moses holding the Ten Commandments. The watch’s movement is rusted as a result of immersion in salt water, the hands are nearly all deteriorated and the dial is stained. Kantor’s pocket watch will go under the hammer at Heritage Auctions in Dallas, Texas, on August 25. What Sank The Titanic? Well a new documentary Collision Course: Titanic opens the debate again that something other than just rivets and an iceberg were the cause of the sinking. Being shown on Reelz starting yesterday (19 Aug), the circulars claim it will claim the rivets did not fail. Whether it rehashes already old theories or has something new to offer remains to be seen.